Sam recommends using a really creamy tahini, one that you often find at Middle Eastern groceries if you can. And you always want to use more than your gut tells you is right. 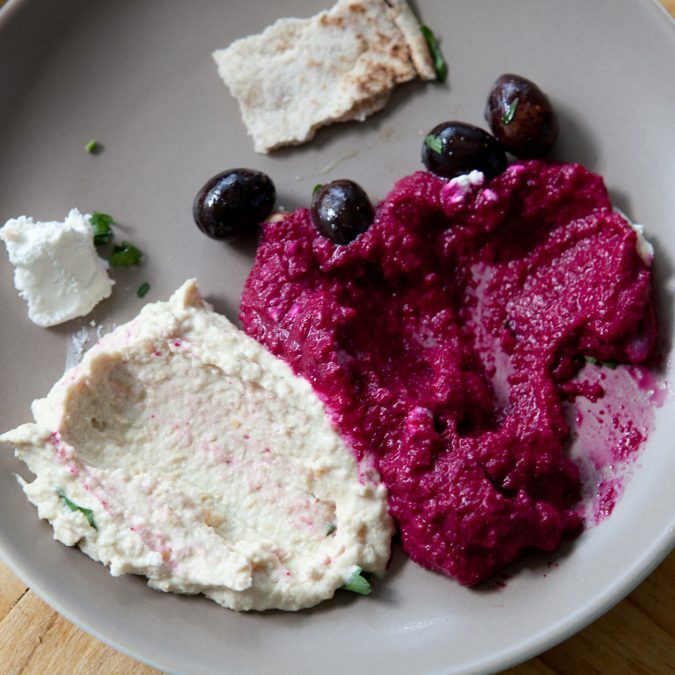 Tahini is what really makes a good hummus. That and garlic. Normally, Sam would use twice as much garlic in this recipe, so if you like garlic, feel free to add a few additional cloves. He knows that I tend to like a little less garlic, so this is how we prepared it this time around. Add the chickpeas and garlic to the bowl of a food processor and pulse until roughly chopped. Add the tahini, salt, half the amount of water and lemon juice and process continuously for about 30 seconds. Add the rest of the water, and process until the consistency is right where you like it. We made ours a little chunkier — you decide where to stop. Taste the hummus and season with a little ground pepper and more salt if you’d like. Transfer to a serving dish. Store leftovers in the refrigerator in an airtight container for up to one week.